Since it's introduction in 1998, the Hume H715M W/C (With Clip) inside the waistband holster has been very well received by the concealed carry community. With the H715M W/C, Hume set out to create a quality clip-on IWB holster that performs and conceals well, while remaining affordable. Rather than use a "one-size fits all" approach, this holster is sized to fit the specific pistol it was intended to carry. For example, Don Humes produces separate skus of the H715M W/C holster for the Glock 17, Glock 19, and Glock 26 that are specific to the barrel of each pistol. The H715M is manufactured in the USA using 6-7 ounce premium leather, the highest quality nylon thread, and a strong metal clip. This model comes in either black or saddle brown leather but the clip only comes in a black oxide finish. The clip is designed to fit a gun belt up to 1 3/4" wide. The holster features double stitching, and a reinforced mouth for easier reholstering. Holsters are specifically molded for a certain handgun and then tested for fit and performance. The H715M W/C model has proven to be one of our top sellers based on quality and value. It's an excellent choice for concealed carry, and seems to perform best when worn in the strongside position or just behind the hip. How to tell if they holster model you are interested in is in stock: On the dropdown menu out beside each holster, there will be a notification if the holster is in stock or out of stock. In stock holsters will be marked as "In Stock" and out of stock holsters will be marked as "Preorder: 30 to 90 day ETA". #1 - Can this holster be worn outside the waistband on the belt as a clip-on OWB holster? No, it's not designed that way and won't function that way. #2 - Will the clip stay in place when the handgun is drawn? There's a 2 part answer to that question: First, like most any leather holster, this model has to be properly broken in. Second, the clip has a bottom lip that is designed to ride underneath the bottom of the belt to keep the holster in place. #3 - I'm looking for the model with a bodyshield, but don't see it? That's the H715M WCS model and it can found here. #4 - Why is Don Hume running 30 to 60 days behind? Great question. In the last few years, Don Hume has drastically changed its business model. They no longer sell direct to the public, and they no longer keep any stock on hand. As a result, all purchases now have to go through a stocking dealer (like us), and the dealers are now responsible for keeping stock on hand. In light of those changes, it's taking Don Hume anywhere from 30 to 90 days to complete an order for a dealer from start to finish. For the most part, there areFirst ofPlease feel free to email us or call 919.388.1991 to for any questions. like I said man.... its cool. The first one I bought was over ten years ago for my SP101. It's been a great carry piece for me. It still use that same holster. It's showing a bit of wear on the outside, but that thing has been everywhere with me. From the city, to the deserts and mountains. Scaling cliff rock shelves, other manual labor and even working in the garden. Just recently I sent in another revolver to Ruger for repair and they couldn't fix it. They traded me up for the SR9c plus some extra magazines. I tried a couple different holsters from Galco and they just didn't quite fit me right. So I went back to the tried and true Hume 715M. I bought this for a 1911 4" barrel. I have one for an M&P 40c and it has not given me any problems. It fits the pistol well and is comfortable to wear for IWC. I have been using this holster for close to 10 years, and it's the only holster I use. I have some high end holster, and Hume holsters are every bit as good. The quality even beats out some holsters I have by Kramer. Good leather. Attention to detaiyou can't go wrong with a Hume holster. I've been carrying a full size B92 in a holster like this one since sometime in the early 2000s. It has always worked as designed and in hundreds of draws in competition and thousands in practice it has always worked flawlessly. It fits my Ruger. It's made well and is comfortable to wear. Gunner's Alley made it easy to order with fast shipping. This is an inexpensive well-fitted holster. Get one and you will like it, I think. I have a Smith & Wesson 60-15 Pro Series J-Frame with a 3" barrel. Finding a IWB holster for this gun has not been easy. The Don Hume holster is perfect. Quality leather. Secure gun fit. Secure metal clip. Comfortable concealed carry. Very happy. 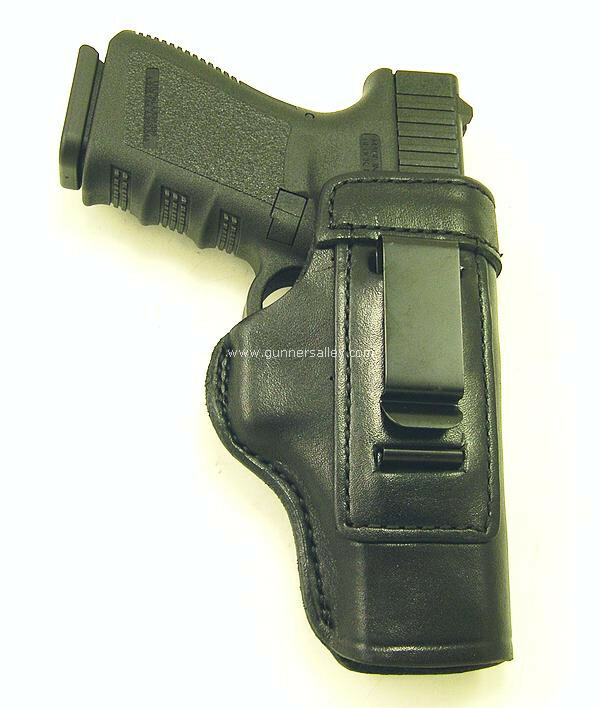 Really great holster for low profile, small of back concealed carry. Ordered left hand model for right hand draw. Took 3-4 months to get it in hand, but worth the wait. Click the button below to add the Don Hume H715M WC Clip-On Inside the Waistband Holster to your wish list.